I have a Geopolitics exam tomorrow. So I decided to take a break and draw this picture for you. This picture explains my current plight. 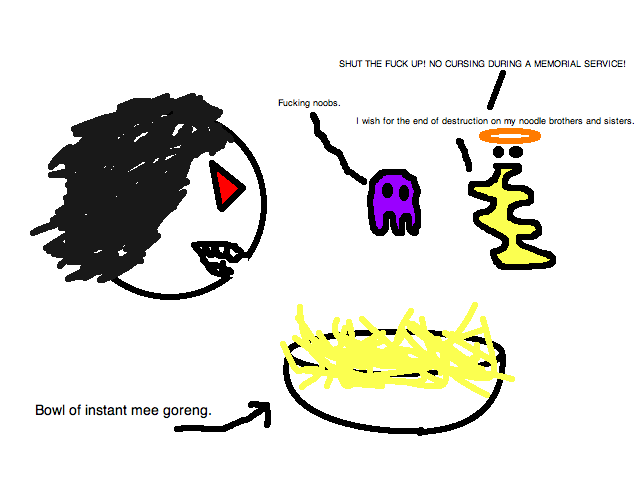 I have been eating instant mee goreng (fried noodles) for the past two weeks EVERYDAY, partly because I am trying to cut costs (IMMA POOR STUDENT) and partly because it’s exam period and I can’t be fucked to cooked. During the two weeks of eating instant mee goreng for dinner (and sometimes lunch too), I feel like I’ve been killing innocent strands of noodle after noodle. I’m the cool pacman with awesome hair, eyes and teeth. This entry was posted in Food, Random Rants, University of Sydney by Zareth. Bookmark the permalink.